The Ag Journal reports that freeze puts chill on Oklahoma wheat outlook. Oklahoma State University agronomist Jeff Edwards (above) and Kansas State University agronomist Jim Shroyer will be scouting wheat fields for freeze damage in the days ahead. An overnight freeze early this week had the potential to cause damage to a significant portion of the 2009 wheat crop. Enid, Okla. — Add extensive freeze damage to the hazards that could significantly reduce this year's crop of hard red winter wheat. A significant portion of the crop was at risk — and may have been permanently damaged — by the latest spring cold front that moved across the Southern Plains this week. While earlier spring snowstorms brought needed precipitation to a wide portion of the region — as much as 30 inches in one day in West Central Kansas — the unseasonably cold temperatures that followed will likely take a heavy toll. "Normally I'm an optimist about everything but this has me spooked," said Jeff Edwards, small grains agronomist for Oklahoma State University. Northwest Oklahoma, the Texas Panhandle and Southern Kansas posted new record lows on Tuesday night. Freezing temperatures plunged all the way south of the Red River. Agronomists won't know the full extent of the damage for another week or so, but temperatures in the lower 20s can "hammer" wheat at its current growth stage, already accelerated by drought stress, Edwards said. According to the Oklahoma Crop and Weather Update, 86 percent of the Oklahoma wheat crop had reached jointing stage when the cold snap hit. 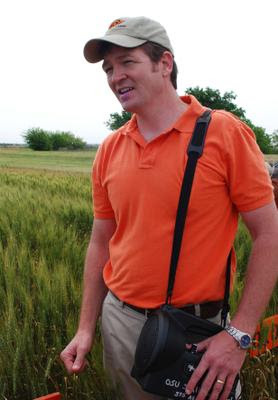 Oklahoma Wheat Commission Executive Director Mike Schulte estimated the crop was probably two to three weeks ahead of normal development. About 20 percent of the Kansas crop was estimated to be at a similar stage. Agronomists were just starting to get a handle on harm from the earlier storm in late March, which brought heavy snow to many areas and also left behind some preliminary signs of damage. "It got the guys who maybe planted earlier than they should have or had heavy fall forage growth or drought stress on the crop, so it was marginal anyway," Edwards said. "In other words, it got the wheat with not quite as good of yield potential. This time around I think all were susceptible, all were at risk, even if they did everything right." In Oklahoma, the state's best looking wheat was in the central and north central regions where temperatures plummeted on Tuesday and remained well below freezing for around eight hours, making damage likely. The Oklahoma panhandle, already under severe drought stress, could squeak by due to lack of maturity. "They are the furthest behind in terms of development so they could still come out okay," Edwards predicted. He was quick to caution that the jury is still out on the extent of damage. "We can't tell the damage until next week. Farmers don't need to throw in the towel — yet. Freeze damage is not an exact science," he said. "My recommendation for growers would be to do something for the next seven to 10 days to take their mind off of it — play golf or go on a vacation — that's the best thing they could do. Then, after 10 days of good growing conditions, come back and inspect it. Then you can make the call." In Southern Kansas, yield potential was probably reduced to some extent by the storm in late March, according to Jim Shroyer, Kansas State University Extension agronomist. But the risk of damage will be higher this time around, especially without a blanket of snow to protect the crop. He called the situation "touch and go." Much of the wheat crop from Texas to Colorado was already under pressure from drought. Even factoring in the late March snowstorm, western and central Kansas are well below average in precipitation accumulation. Prospects now look better in Colorado, where spring snows provided much-needed moisture and at least half the crop is rated good to excellent. The erratic spring weather has been generally bullish for wheat prices, which trended upward the last two weeks as crop conditions deteriorated. Winter wheat accounts for about three-fourths of total U.S. wheat production. Total worldwide wheat production is forecast to fall this year. Some market observers are making comparisons to a widespread late freeze in 2007 that greatly diminished the wheat harvest and put prices on a bull rally that lasted for more than a year. USAgNet reports that Texas freeze damages already struggling wheat crop. The latest freeze isn't only hurting home gardeners in the Lone Star State, it's killing the hopes of a lot of Texoma wheat farmers. Many of them have invested more than they ever have this year in their wheat crop, paying high prices for fuel and fertilizer, but with little rain and spring freezes, they're left with what's looking like a dismal harvest come May. "They weren't going to make much and this is kinda the last nail in the coffin, really. You don't really know what to tell them and you don't know where they're going to go from here. I'm afraid that some of them aren't going to be able to, to continue to farm much longer." Baylor County Extension Agent Brad Easterling says, unless a significant amount of rain comes by May, the most some farmers will be able to hope for is enough wheat for seed to use next season. My reaction: Last week, I wrote about a hard freeze damaging wheat crops in southern plains. As expected, freezing temperature look certain to have damaged US wheat crops. 1) Temperatures in Northwest Oklahoma, the Texas Panhandle, and Southern Kansas hit record lows on Tuesday night. 2) Temperatures in the lower 20s can decimate wheat at its current growth stage (86 percent of the Oklahoma wheat crop had reached jointing stage). 3) Oklahoma's best looking wheat was in the central and north central regions where temperatures plummeted on Tuesday and remained well below freezing for around eight hours, making damage likely. 4) Much of the wheat crop from Texas to Colorado has already been under pressure from drought. 5) Winter wheat accounts for about three-fourths of total U.S. wheat production. 6) With little rain and spring freezes, the most some Texan wheat farmers will be able to hope for is enough wheat for seed to use next season. Conclusion: Drought and extensive freeze damage will significantly reduce this year's crop of winter wheat. With production falling around the world, food prices look certain to head much higher in 2009. Its a shame ,Farmers and Ranchers work so hard, my dad and I were seed cleaners for over 33 years we met alot of them, the nicest people i have ever met. Hopfully they will make it threw next year, and it will be better, there's never good times with out the bad.